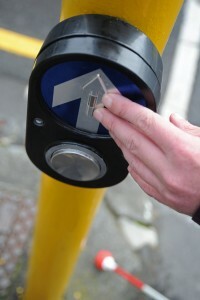 Getting around confidently, safely and independently when you are blind or have low vision is key to living your life. You might want to travel to your job or head to the local bank. Visiting family and friends, or taking part in your favourite hobby, can be important too. Whatever your mobility needs, the Blind Foundation’s team can help you develop skills, techniques and strategies to get about safely and easily. Our qualified and experienced team can help you make the most of any vision you might have left, while maximising your other senses. They teach guiding techniques so you can help others properly guide you. The team will also show you ways to walk safely down a street, around a building or across a busy intersection. Inside or outside, they’ll help you deal with problematic areas such as uneven surfaces and steps. They can also advise you how to make it easier to get around your home, work or other places. And to ease the frustration when you drop something like your keys, they’ll demonstrate a range of easily-remembered search techniques. So you can move about safely and comfortably, they’ll introduce you to aids like canes, monoculars, electronic devices and sunglasses. When you have the basics mastered, the team will talk to you about developing your advocacy skills. You can learn how to best seek assistance or contact your local council about improving your services or environment. The Blind Foundation also works with local councils, district health boards and other organisations to help create safe and more accessible environments.